Armscye ~ The armhole or the opening in a bodice to which the sleeve is sewn. Backstitch ~ This hand stitch, a variation of the running stitch, doubles back on the last stitch. It is is the most common stitch used as it makes a strong seam. Baste ~ Temporary stitches made with a running stitch or a long machine stitch used to hold fabric in place before the final stitching. 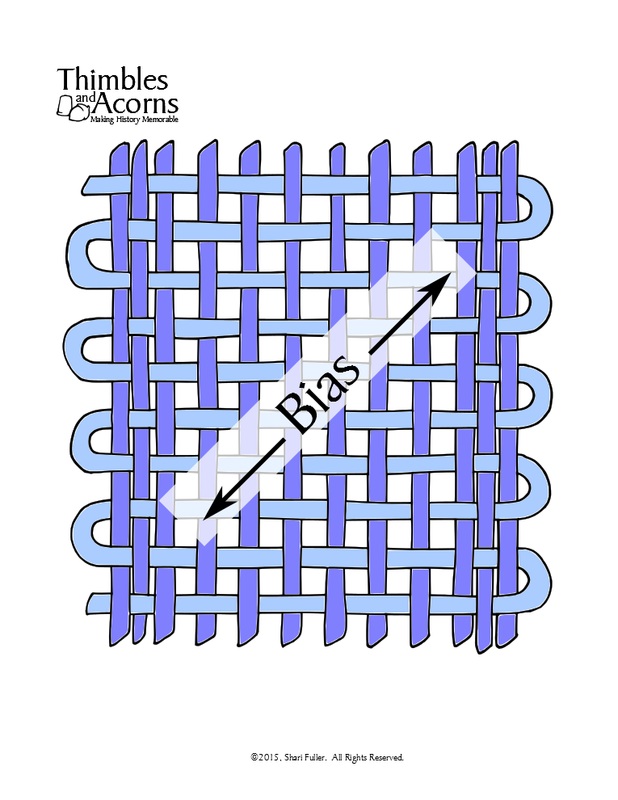 Bias ~ Bias refers to any line diagonal to the horizontal and vertical grains of the fabric. The true bias on a piece of fabric is on an angle 45 degrees to the selvage and allows for the most stretch. Blanket Stitch ~ A sewing stitch in which evenly spaced stitches loop together, forming a ridge along the top edge. Used for cutwork, decorative finishes, and buttonholes. Bodice ~ The part of a garment which runs from the shoulders to the waist. Brim ~ The projecting edge around the bottom of a hat. Button ~ A small disk or knob used as a fastening when passed through a buttonhole or loop. Buttonhole ~ Holes in fabric that are finished with stitching or fabric which allow buttons to pass through and secure one piece of the fabric to another. Casing ~ A folded and stitched tunnel of fabric that is used to hold elastic, cording, or boning. Clip ~To cut small slashes inside the seam allowance of an inside curve to help rounded edges turn and lie neatly. Crotch ~ The part of a garment that passes between the legs. Crown ~ The top part of a headpiece that covers the head. Cuff ~ A fold or band that trims or finishes the bottom of a sleeve. Cutting Line ~ On a pattern, the outermost dark line upon which you cut. Dart ~ A tuck of fabric that descends into a point at each end that is sewn into fabric to take in ease and provide shape to a garment. Double-fold Hem ~ A hem that’s folded once for the hem allowance and a second time to enclose the raw edge. Ease ~ The method of fitting a length of fabric into a slightly smaller space without resulting in gathers or puckers. Also, extra room added to a garment beyond the measurements to make the garment less restricting. Edge Stitch ~ A row of stitching within 1/8-inch (3 mm) from an edge or seam line. Facing ~ A section of fabric, used to finish fabric edges and provide extra stability. Finger Press ~ A method of temporarily pressing a seam or creasing fabric using your fingertips. Finished Seam Allowance ~ A seam allowance where the cut edge has been bound, most commonly done with a zig-zag stitch on a sewing machine or a serger. Flounce ~ A type of fabric manipulation similar to a ruffle, but with less bulk. Fold Line ~ A line along which fabric is or is to be folded. Gathering Stitches ~ Parallel rows of running stitches sewn along one edge of the fabric to be gathered. To create gathers, the stitching threads are pulled or “drawn up” so that the fabric forms small folds along the threads. Grainline ~ This refers to the position of the horizontal and vertical threads in a woven piece of fabric. It also refers to the long arrow symbol on a pattern piece that corresponds with the vertical threads on a woven fabric. Hem ~ A garment finishing method, where the edge of a piece of cloth is folded under and sewn to prevent the fabric from unraveling. Hook and Loop Tape ~ A fastening tape consisting of a strip of nylon with a surface of minute hooks that fasten to a corresponding strip with a surface of uncut pile. Interfacing ~ A secondary woven or non-woven fabric that and be fused or sewn onto a primary fabric to add stability, body, reinforcement, or shape. Joining Stitch ~ An overcast stitch used to join two edges of fabric together. Narrow Hem ~ A hem made with a 1/2-inch to 1/4-inch hem allowance that is folded in half twice to form a 1/4-inch to 1/8-inch wide hem. It can be finished with either topstitching or or whipstitching. 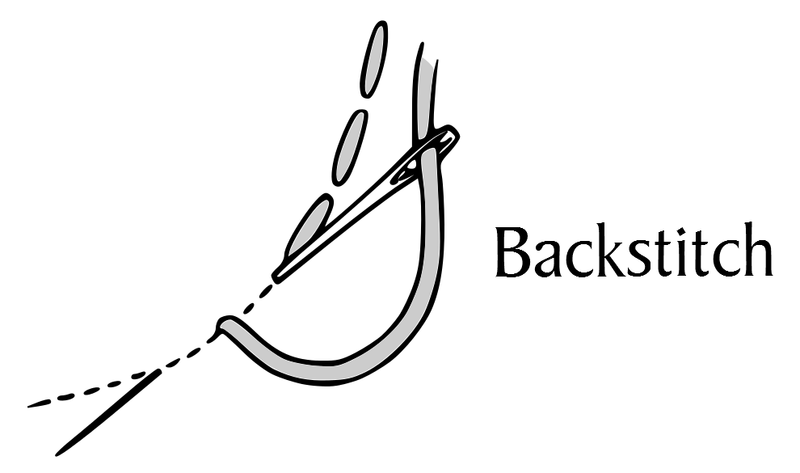 Neckline ~ The edge of a garment at or below the neck. 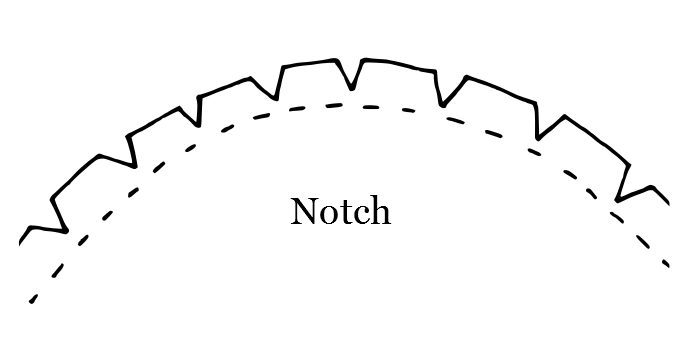 Notch ~V shaped clips cut inside the seam allowance of an outside curve that help rounded edges turn out and lie neatly; also refers to pattern markings shaped like diamonds or triangles that are printed on the cutting line of a pattern to indicate where seams should meet. Pattern ~ A template for the pieces of a garment that includes markings for specific details and construction guides. Placket ~ Overlapping layers of fabric along a garment opening that supports or hides buttons and buttonholes or other closures. 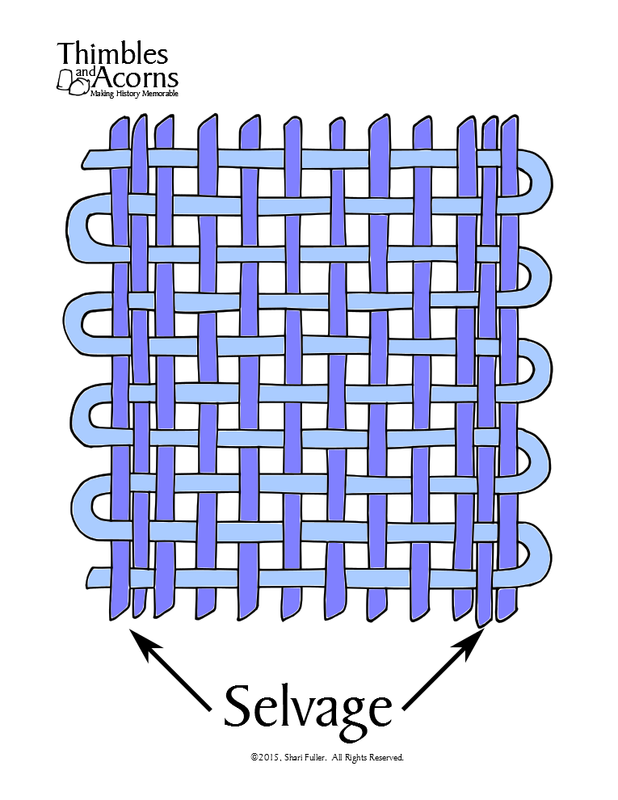 Plain Weave ~ A weave in which the weft and warp threads interlace alternately, forming a checkerboard pattern. Pocket ~ a bag or envelope like receptacle that is fastened to or inserted in a garment. Earlier in history, a pocket was a separate small pouch. Proper Left ~ This refers to the wearer’s left side. Proper Right ~ This refers to the wearer’s right side. Raw Edge ~ A cut edge of fabric that hasn’t been finished. Ribbon ~ A long, narrow strip of fabric, used for tying things together or for decoration. Right Side of Fabric ~ This is the side of the fabric with the printed pattern or design. On unprinted or untextured fabrics, both sides may be the same, so the right side is determined by which side will be the visible. In pattern instructions, the right side is shaded in illustrations. Rolled Hem ~ A hem made with a 1/4-inch hem allowance that is rolled under with the forefinger and thumb to form a 1/8-inch wide hem and finished with a simple blind stitch as the hem is rolled. Ruffle ~ A strip of fabric, lace, or ribbon pleated or gathered on one edge and applied to a garment or other textile as a form of trimming. Running Stitch ~ Also known as the straight stitch, the running stitch is the basic hand-sewing stitch on which all other stitches are based. The stitch is worked by passing the needle in and out of the fabric. Satin Weave ~ A weave in which the weft threads interlace the warp threads in widely separated intervals, producing the effect of a smooth unbroken surface. Seam ~ A line of stitching that holds two or more pieces of fabric together. Selvage ~ This is the tightly woven factory edge of fabric that runs parallel along each side of the lengthwise grain. Skirt ~ A part of a garment that fastens around the waist and hangs down around the legs. Snap ~ A two piece fastener that is engaged pressing its two halves together. Stay Stitch ~ A straight stitch sewn through one layer of fabric that is most often used around a curve to reinforce a seam line and to prevent distortion. Twill Tape ~ A flat twill-woven ribbon of cotton, linen, polyester, or wool used to reinforce seams, make casings, bind edges, and make sturdy ties. Twill Weave ~ A weave in which the weft threads are woven over and under two or more warp threads, producing a diagonal pattern. Waistband ~ A band of fabric that encircles the waist of a garment. Warp ~ These are the vertical threads in woven fabric that runs parallel to the selvage. Weft ~ These are the horizontal threads in woven fabric that run perpendicular to the selvage. Whipstitch ~ A sewing stitch that passes over an edge of cloth to join, finish, or gather. 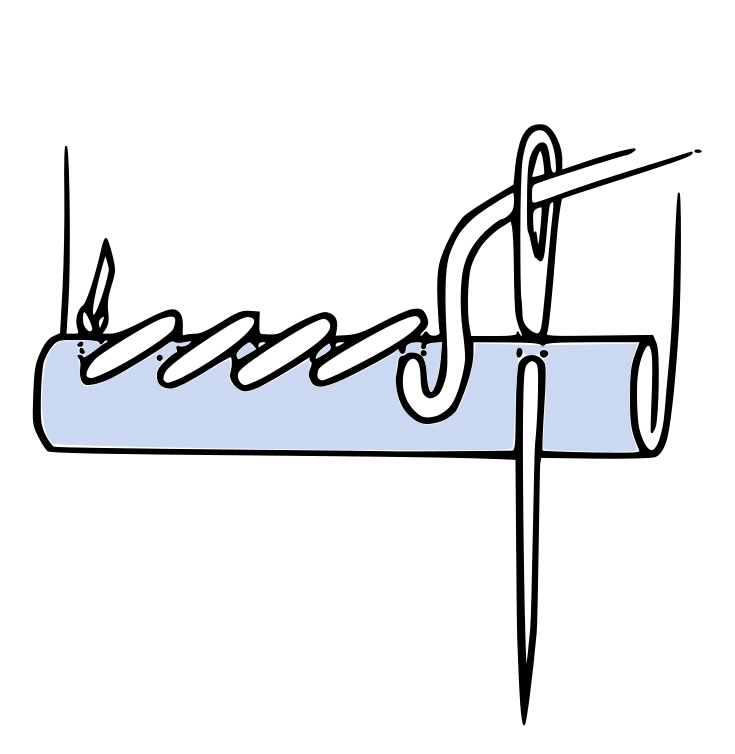 Whipstitch being used on a double-fold hem. Wrong Side of Fabric ~ This is the side of the fabric that is unprinted or without intentional design. On unprinted or untextured fabrics, both sides may be the same so the wrong side is determined by which side will be the unseen. In pattern instructions, the wrong side is unshaded in illustrations. Yoke ~ A fitted part of a garment, usually around the neck and shoulders, or around the hips, that provides support for looser parts of the garment, such as a gathered skirt or bodice.